According to German magazine, Stern, Audi could be preparing a short-run series based on its Clubsport Quattro Concept revealed last week. 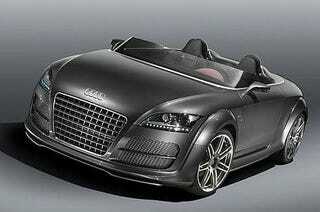 The mag reports 200 units of the short-windshield Audi TT roadster models could be built. No word on how true the production version would be to the concept, which sports a 300-horsepower version of Audi's 2.0-liter TFSI four, its S-Tronic (DSG) dual-clutch gearbox, 20" wheels and ceramic brakes. Whatever happens, we'd imagine the DOT will have something to say about that windshield.